I'm sure many of you have been to a tented wedding reception, an entertainment venue or a corporate event where there were temporary air conditioners. Did you see the tractor-trailer mounted monstrosity? Or was it the roar of the generator that drew your attention? There is a RIGHT way to air condition special events. You work so hard to create the "magic" of the moment and you certainly want guests to be comfortable. There seems to be a constant struggle between the what you want to do and what site limitations will allow. 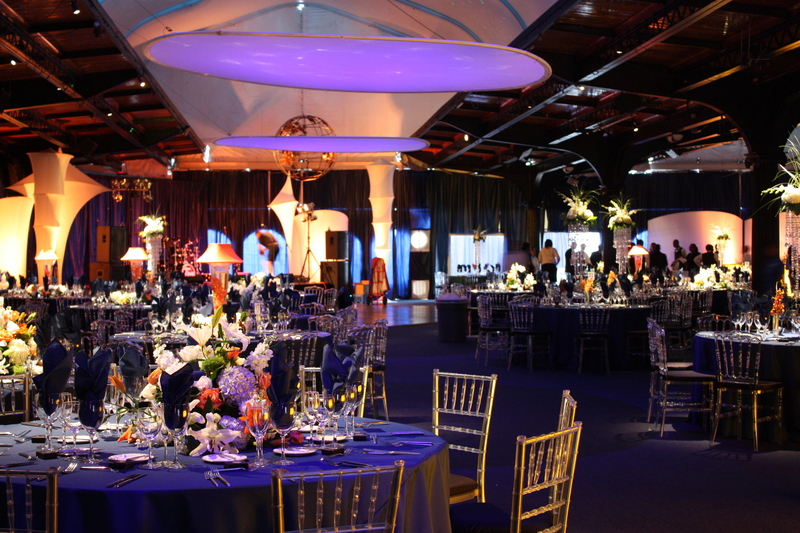 This elegant event was created by the talented crew Magic Special Events. The gala celebration was held at the Science Museum of Virginia in Richmond, VA. 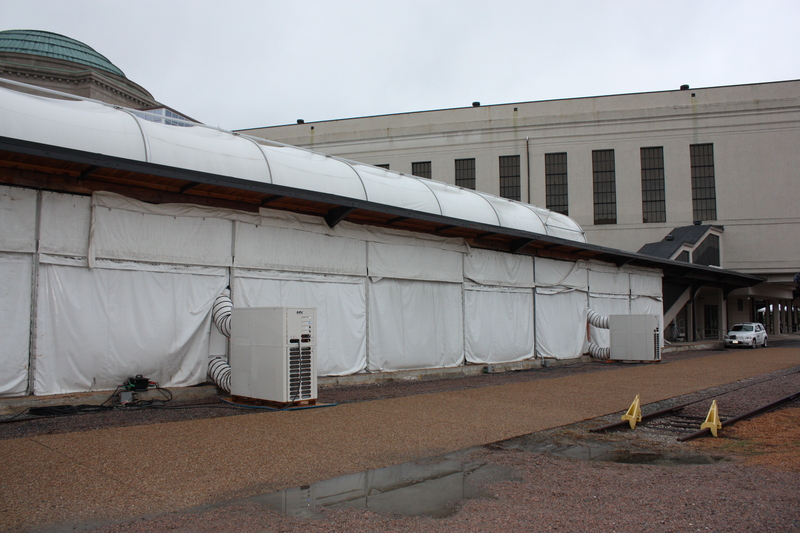 Here's what the Thalhimer Pavilion looks like from the outside -- and to be honest, it doesn't look much better from the inside! The outside of this pavilion is drab and dreary, much like the inside -- it's a huge wide open space filled with metal and concrete. OK, the rainy, overcast day doesn't help paint a cheery picture but even with the drizzle -- you have to admit -- this space has no sizzle! No WOW factor! A "blank slate" can be the perfect canvas for someone with a vision. And that's exactly what Magic Special Events had. Easy unit placement when space is tight. Not have to rent a generator. Have a quieter, cleaner installation -- no generator noise or tank refueling. Use tent transitions and supply/return registers. Sure makes for a better looking installation. No ducts to hang in the structure. No disruption to the decorating theme. If you want to take a peak at this event album, you can check out the photos on Facebook. If you have questions about the fantastic decor, I'm sure Harry or Woody at Magic Special Events would love to chat with you. Want to find out more about air conditioning special events? Check out this easy-to-read temporary air conditioning guide.